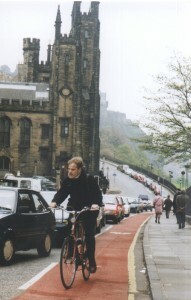 The Edinburgh examples below all date back 10-20 years. They w ere a huge advance, they were just politically achievable at the time [segregated facilities certainly were not], they raised cycle use without increasing injuries, and they still retain much value [imagine what those roads would be like if they were removed!] 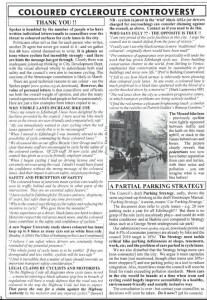 It is easy to forget this historical perspective, but it is worth looking back at the extremely positive comments by the increasing numbers of ordinary cyclists about the red cycle lanes when they were under threat – as in this page from Spokes 93 [Spring 2006]. 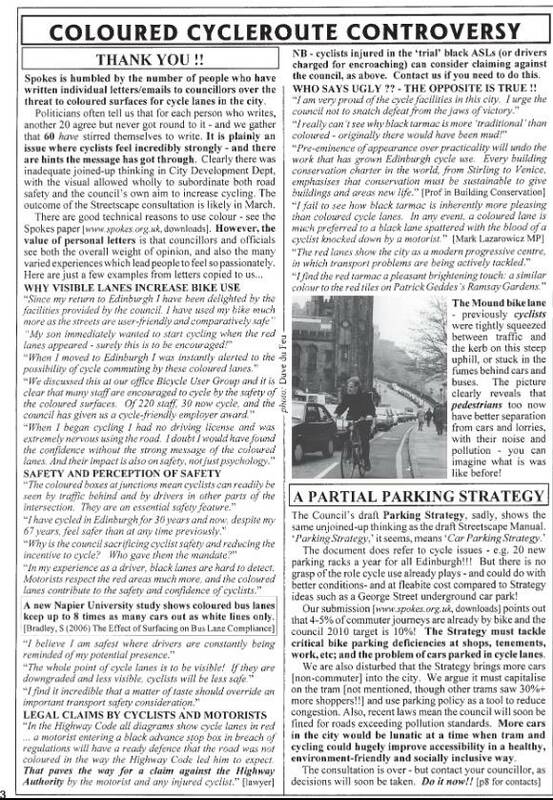 The historical perspective is further discussed in section A of our 2012 submission to the UK Parliament All Party Cycling Group Inquiry, Get Britain Cycling. Segregated facilities must now be the preferred option for new investment but given the cost and political difficulties of reallocating roadspace a fully segregated all-city network will take time – indeed even Dutch and Danish cities are still in the process of converting ‘traditional’ roads. Thus it is important to maintain to a high standard (and in some locations extend) the red lanes, in places where segregated facilities or car-free roads are not yet realistic politically and/or financially. 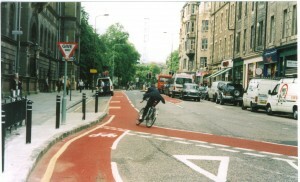 For the immediate future, coloured lanes still have an important role in such locations. Like everything, there is good and bad, and it’s always great fun to highlight the bad [as in the Crap Cycle Lanes book]. But if any of the examples below were removed, unless it was for something better, there’d be a riot! Uphill past the queuing traffic. A much better environment for walkers and buggies too – less noise, less fumes, less annoyance and no splashing on wet days. Altogether a much nicer place to enjoy Edinburgh, whether by bike or on foot. 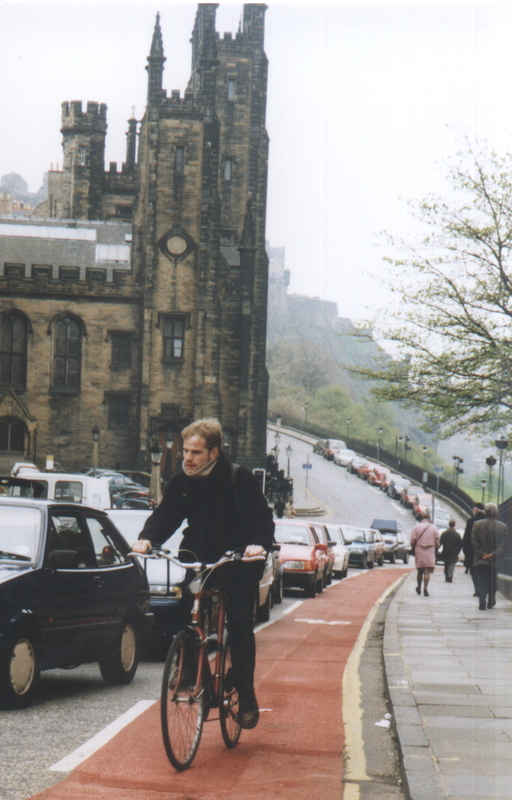 Just imagine what it was like before – cycling or walking – especially when the queue included buses and lorries. After our campaign to remove parked cars. The car is also giving a really wide berth to the cyclist in the red cycle lane! Some people say councils put in bike lanes because it’s easier than banning car parking. Not true here! The fact that cars were blocking the bike lane was the very argument we and the hospital bike user group used to get parking banned. Without the bike lane, chances are that the parking would still be here.